Easter is less than two weeks away! Can you believe it? One of my favorite Easter traditions is decorating eggs! As a kid, I absolutely loved seeing the eggs change color the longer we left them in. I came to associate that vinegar smell with the Easter holiday! Don't we all? As a mom, I love seeing the joy on my children's faces as they follow along on this tradition. Still, with so many options on egg dying these days, while the decorating might be tradition, the HOW is ever-changing! 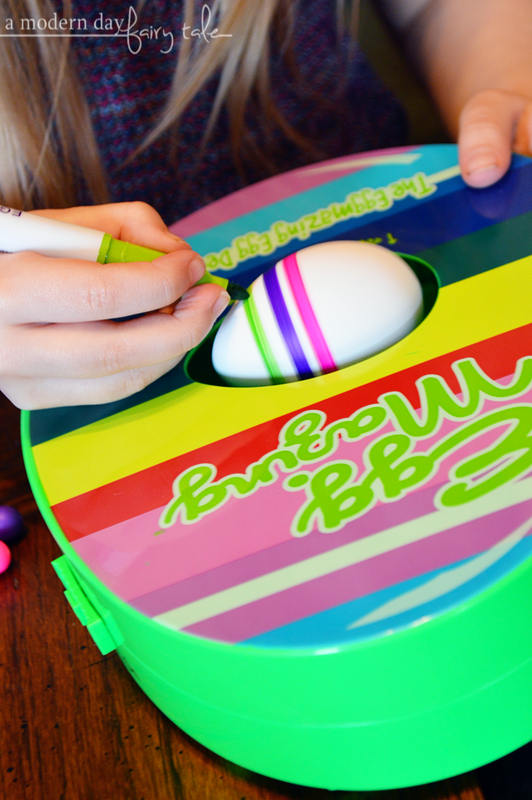 We've done traditional dyes, we've dyed with kool-aid and more... but today, I'm excited to share the coolest way we've found to decorate our eggs yet- The EggMazing Egg Decorator! 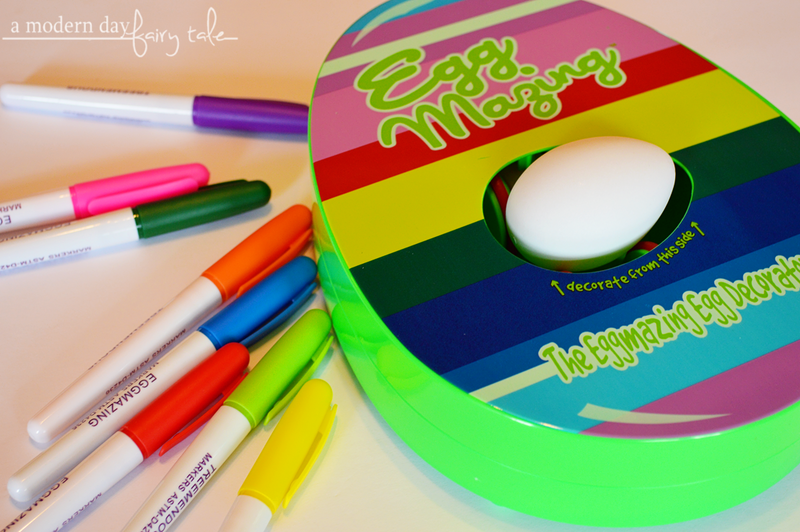 Some of you may have seen the EggMazing on Shark Tank, but for those who haven't... EggMazing features a stable, battery operated design that spins your egg allowing you to decorate with a simple touch of the marker! All you do is place the egg onto the platform and switch it to on to get the egg spinning. Choose the colors you want and place gently onto your egg. The EggMazing does the rest! Very easy! Of course, that all SOUNDS great, but how does it really work? My kids and I recently had the chance to put it to the test! First of all, what is included? 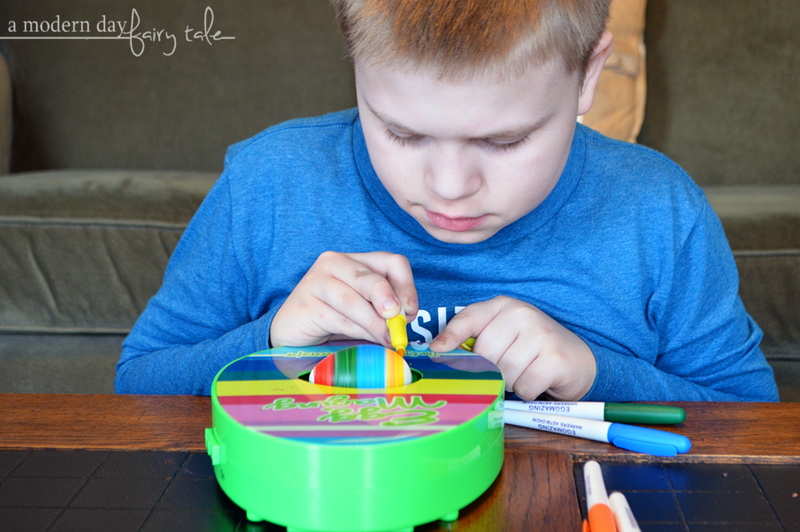 Each EggMazing Egg Decorator comes with the base and a set of 8 non-toxic markers, everything you need to get started... eggs excluded, of course. It does require 4 AA batteries which are not included. After you've added your batteries, everything else is truly ready to go right out of the box. No dyes to mix up, nothing to assemble... just sit the egg on the rolling area and go. 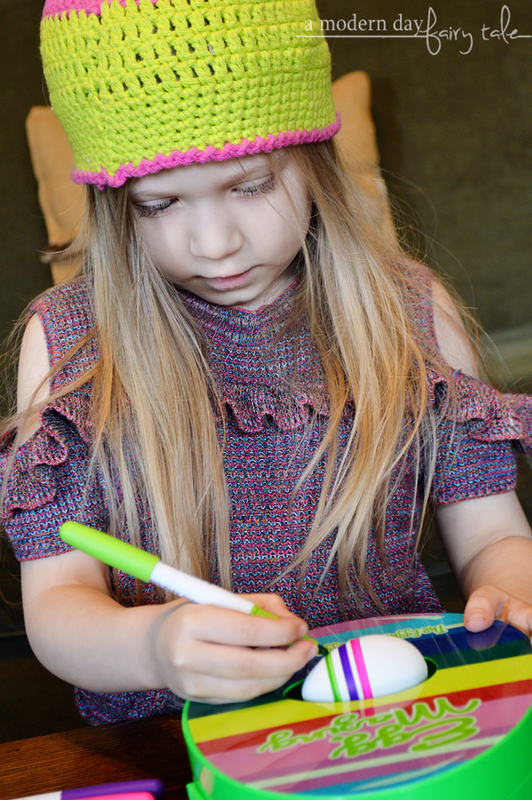 Because it's a little early to start decorating our REAL eggs just yet, we decided to try it out with some craft eggs. These are the same size as your typical egg, but it is important to note that they ARE hollow and therefor significantly lighter than real eggs. They're perfect for creating decorative eggs though and that was just our intention. The egg decorator was very easy to use--- even my 5-year-old was able to do it with no help at all. The spinning design allowed us to get perfect stripes every time. I will say that we found that when we got to the very tips, our eggs would like to come of the device when the marker met it. Again though, this is why I mentioned that we were using FAKE eggs. With an actual egg, it is going to have some weight to hold it down, so I don't see this being a problem in the slightest. Still, if you are wanting to decorate some craft eggs like we did, that is something to keep in mind. The kids loved it because it was fun... I mean really, it's like a toy that just happens to decorate eggs--- didn't we love similar art toys when we were children, too? It kept things interesting, and allowed them to create beautiful multi-color designs that they would not be able to create with your typical dying techniques. As a mom, I loved that it was mess free! Now, like I said... I love watching my kids dying and decorating their eggs. But the cleanup? Well now, that's something I could do without. Let's be honest... kids are messy! Give them cups full of dye and it's only a matter of time. It happened to us last year--- all was going well until a cup was knocked over. We'd protected the table, but the bench, the floor, the fridge and the cabinets that were all splattered with dye were one tough job to clean up! 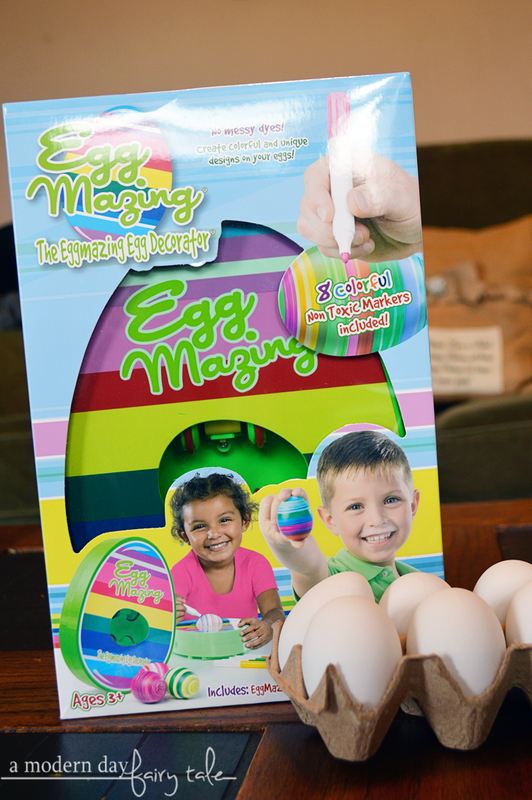 With the EggMazing, there's no cleanup at all! No spills! No vinegar smells! No dyed hands at Church on Easter Sunday! 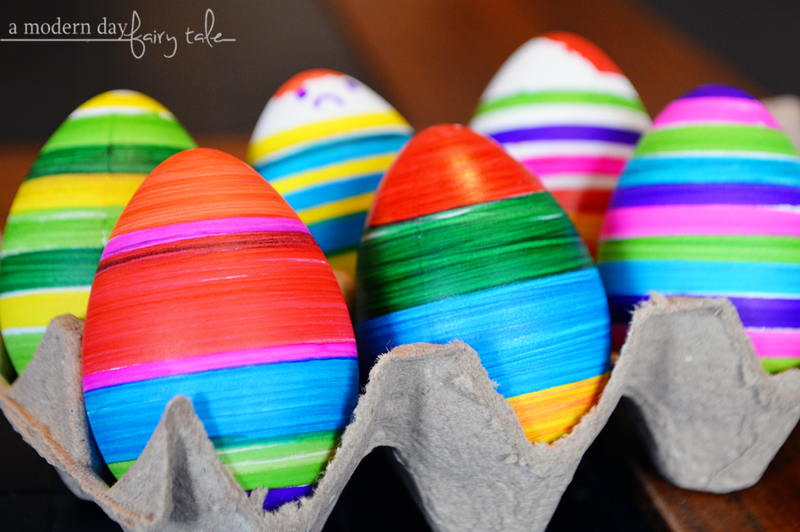 Just fun for the family and beautifully colored eggs! Are the eggs safe to eat? As I was doing my research on EggMazing there seemed to be a lot of question about this. I believe some of the confusion on this was the message on the EggMazing that says not to eat decorated eggs. To be clear however, this has nothing to do with the product itself, but rather USDA's recommendations for safe egg handling which should apply to ALL decorated eggs, regardless of the decorating technique used. The markers included are non-toxic and ASTM D4236 tested (lead-free)... perfectly safe! I love how they say it on their website best, “I personally have eaten plenty of decorated eggs. In Texas, we hunt Easter eggs all day long in the hot sun. I wouldn’t recommend anyone eating an egg in that situation.” Makes perfect sense, right? I really love decorating eggs but don't love the mess - this looks fantastic! This would be great for my granddaughters to decorate their eggs this year.